I bought my flip flops at Old Navy because I think they have the most comfortable flip flops, they are cheap (2 for $5) and they come in all sorts of fun colors! The fabric I chose is no longer available, but you could easily use your favorite cotton fabric or even scraps of what you already have. One: Remove the plastic do-hickeys that come on the flip flops. Two: Start with a strip of fabric that is about 1 inch wide and about 10 inches long. Tip: Don’t cut this piece, simply snip about an inch into your fabric and then pull and tear. So much easier! Three: Fold strip in have and poke up through the bottom of the top center hole – where your toes go, but don’t tie the knot yet. Four: Tear a piece of fabric that is about 4 inches wide and about 25 inches long (this will give you lots of extra but that is ok – rather too much than not enough). Five: Thread one end of the 4-inch strip through one of the bottom holes on the flip flop base and tie a tight not. Six: Pull the 4-inch strip through the 1-inch strip’s loop. Seven: And back down to the hole on the other side of the flip flop. Eight: Fit the flip to your foot by pulling on the straps to where it fits you comfortable and tight enough to stay on. Nine: Tie the strips of fabrics into knots and trim off the excess fabric. Ten: Hot glue around the knots to make them just a bit more secure into the holes of the flips flops. Because there are already holes in the flip-flop bases the knots fit pretty well inside and you can’t feel those knots when you are walking. My new Fabric Flip Flops are so cute and I can’t wait to hear all of the compliments I’m going to get on them! What colors will you choose for your new Fabric Flip Flops? Share and leave a comment below! 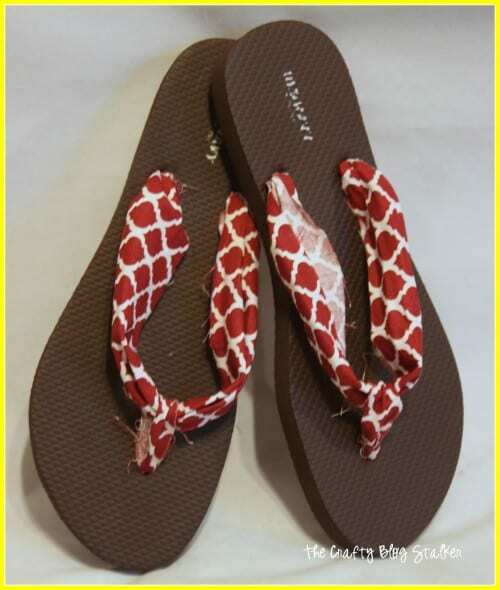 SAVE HOW TO MAKE FABRIC FLIP FLOPS TO YOUR FAVORITE DIY FASHION PINTEREST BOARD! this might work for the kiddos who complain about the strap in between their toes. I am a flip flop girl, too! These are really cute! I wanna make some of these!! Cute!! I Pinned you and also sent this to my daughter who is also a flipper fanatic. So cute! I think this will be a perfect project for my daughter and I. We have our weekly link party going on now, we would love for you to share your great flip flops with our readers. Can’t wait to see you there! Cute cute cute! Thanks for sharing – this craft looks fun and easy! I’ll definitely have to try because, like you, I’m a flip flop girl! Picked up your card at the BYB13 and I’m following you in every possible way. Hope you’ll follow me back because I’d love to get to know you! These are sooo cute, perfect choice of fabric. I will have to give these a try for sure. Great job! Super cute! Thanks for sharing. I pinned. SOO CUTE! Thanks for sharing. How come I’ve never seen this before? Katie, thanks for stopping by my blog! I’ve spent the last half hour lurking all over your site! I’m your newest fan! This is such a cool idea! 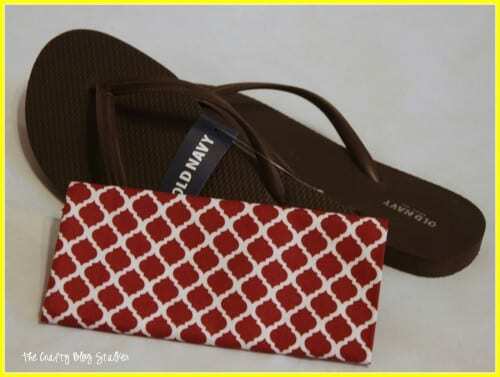 I get new flip flops from old navy every summer…I can’t wait to try this! Visiting from Your Whims Wednesday. Thanks so much! Love these! i seriously badly need to make a pair of these this year. old navy flips are SO cheap but I can’t wear them to work and I dont want to pay the money for fancy schmancy ones.. i love the favric you chose! Wonderful tutorial. What a great way to customize your flip flops to match different outfits. You could even make scrunchies to match! Love these! What a great way to make the most with what you have. Also a great way to use up leftover material. We are all about that! Found you from the link party on Pig and Dac. I love this tutorial! I love flip flops and am so excited to have your tutorial to make my own custom ones now! Pinning! these are cute. Thanks so much for sharing with Adorned From Above’s Link Party. That is a great idea Denise. You actually don’t feel the knots if you pull them tight and shove them into the hollowed out spaces where the plastic pieces were. But buttons are a fantastic idea. You are welcome Jan! Thank you for letting me know how much you like my idea. It means a lot to me.